In June 2003, Michael Corleone was recognized as the 11th most iconic villain in film history by the American Film Institute, although some critics consider him to be a tragic hero. Born in 1920 to Mafia don Vito Corleone and his wife Carmela, Michael has two older brothers, Santino "Sonny" Corleone and Frederico "Fredo" Corleone, and a younger sister, Constanzia "Connie" Corleone. The family consigliere, Tom Hagen, is their informal adoptive brother. Unlike his two older brothers, Michael rejects having any involvement the Corleone “family business”, wanting instead to lead a more normal, Americanized life. Vito also does not want Michael to join the Corleone criminal empire, preferring that his favorite son instead go into politics, probably with the intent to gain more political influence. Michael enrolls in Dartmouth College. He later drops out to enlist in the U.S. Marine Corps after the attack on Pearl Harbor, when the United States enters World War II, bypassing his father's attempt to obtain him a deferment. During the war, he fights in both the Pacific and European Theaters, and is wounded in battle. He receives a battlefield commission to the rank of captain and is awarded the Silver Star for bravery. This was later upgraded to a Navy Cross. His war heroism is featured in Life magazine. During the summer of 1945, Michael has been discharged from the Marine Corps, unaware that Vito secretly arranged his release. He returns home to attend his sister Connie's wedding, accompanied by Kay Adams, his college sweetheart. Michael stays for a few weeks before re-entering college without consulting his family. Just before Christmas 1945, Vito is severely wounded in an assassination attempt by drug kingpin Virgil Sollozzo, throwing Michael into the Mafia world he long avoided. Arriving at the hospital, he finds his father unprotected. While awaiting Corleone reinforcements, Michael averts Sollozzo's second assassination attempt on Vito, then affirms his loyalty to his father. Captain Mark McCluskey, a corrupt NYPD officer on Sollozzo's payroll, breaks Michael's jaw before more Corleone men arrive. In retaliation for the assassination attempt, Sonny orders that Bruno Tattaglia, son and underboss of Sollozzo's ally Philip Tattaglia, be killed. Sollozzo later requests that Michael broker a truce, but Sonny, suspecting a trap, refuses and demands the other Mafia families hand over Sollozzo to the Corleone family or else face war. Michael suggests taking Sollozzo's meeting but in a public place; he then proposes that he murder both Sollozzo and McCluskey. Hagen warns that killing McCluskey would violate a long-standing Mafia rule not to kill police officers, and says it would incite a severe backlash from rival Mafia families and law enforcement. Michael successfully argues they can publicly expose McCluskey as a corrupt cop involved in the drug trade and serving as Sollozzo's bodyguard. Sonny agrees and approves the hit. Michael meets with Sollozzo and McCluskey at an Italian restaurant in the Bronx. He retrieves a handgun that Corleone caporegime Peter Clemenza had planted beforehand in the bathroom and kills Sollozzo and McCluskey. This ignites the New York underworld's first Mafia war in a decade. Michael flees to Sicily and spends two years under Corleone ally, Don Tommasino's protection. Michael falls in love with and marries a young local woman named Apollonia Vitelli. When Michael is notified of Sonny's murder, they prepare to move to Siracusa. A car bomb intended for Michael kills Apollonia. It was planted by Fabrizio, Michael's bodyguard who is secretly working for Corleone rivals. Michael returns to the United States in early 1951 and assumes Sonny's role as Vito's heir apparent. After Don Corleone's suspicions are confirmed that Don Emilio Barzini, his main rival in New York, was always the power behind Sollozzo and Tattaglia, Michael and Vito begin a secret, long-range plot to wipe out the other New York Dons. They deliberately allow their rivals to whittle away at Corleone interests to lull them into inaction. Meanwhile, Michael convinces his father the time is right to remove the family from the Mafia. More than a year following his return, Michael reunites with Kay and they marry. He promises her the Corleone family will be completely legitimate in five years. Within two years, they have two children, Anthony and Mary. In the novel, Kay gives birth to two sons. Vito semi-retires in 1954, and Michael becomes operating head of the family. He offers to buy out casino owner Moe Greene's stake in the Las Vegas casino that the Corleones bankrolled, intending to move the family to Nevada and legitimize all Corleone enterprises; Greene refuses to sell. Shortly before his death in 1955, Vito warns Michael that Barzini will likely attempt to assassinate Michael under the pretense of negotiating peace between the families. Whoever approaches Michael about the meeting is the traitor within the family. When caporegime Salvatore Tessio unknowingly exposes his complicity with Barzini by arranging the meeting, Michael sets the plan in motion to murder the other New York Mafia heads: Barzini, Philip Tattaglia, Carmine Cuneo, and Victor Stracci, as well as Greene. In the novel, Fabrizio, Michael's former bodyguard in Sicily, is also killed to avenge Appollonia's murder. The plot unfolds on the same day Michael stands as godfather to Connie's newborn son. Later the same day, he has Tessio and Carlo Rizzi, Connie's abusive husband who conspired in Sonny's murder, executed. In one stroke, Michael re-establishes the Corleone family as the nation's most powerful crime family, and establishes a reputation as being more cunning and ruthless than his father. A distraught Connie accuses Michael of murdering Carlo. Michael dismisses her accusations as hysteria. When questioned by Kay. In the novel, Connie recants her accusations a few weeks later, assuring Kay she was mistaken. Kay, initially believing Michael, later observes him receiving his capos. Clemenza addresses Michael as "Don Corleone" and kisses his hand in the same manner that he did with Michael's father. Kay realizes Connie's accusations were true, and that Michael has become his father's successor in every way. In the novel, Kay leaves Michael, but Hagen persuades her to return. The Godfather Part II is set in 1958 and 1959. The Corleone family has relocated to Nevada, while Frank Pentangeli runs the family's operations in New York, Clemenza having died a few years before. Although Michael is the most powerful Mafia leader in the nation, he still actively works to remove the Corleone family from crime. His efforts have been largely unsuccessful, however, as his many enemies and growing obsession with revenge keep him tethered to the criminal underworld. Michael plans to finally legitimize the family by negotiating with Hyman Roth, his father's former business partner, over controlling casino operations in Cuba. Hours after Anthony's First Communion party, unseen gunmen shoot at the Corleone house, nearly killing Michael and Kay. Michael suspects Roth ordered the hit, and believes a mole within the Corleone family aided him. To uncover Roth's involvement, Michael maintains their business relationship, and orders Pentangeli to settle a dispute with Roth's business partners, the Rosato Brothers. When Pentangeli meets with them, they try to kill him, but he survives. Michael, Roth, and Fredo travel to Cuba to forge a partnership with Fulgencio Batista allowing them to operate casinos in Cuba without interference in exchange for generous payments to the Cuban government. Michael sends his bodyguard to eliminate Roth on New Year's Eve, but Cuban soldiers kill the bodyguard during the attempt. That same night, Fredo unintentionally reveals that he was the mole within the family; Michael confronts Fredo and gives him the Sicilian "kiss of death". During the New Year's Eve festivities, victorious rebel forces enter Havana, forcing Batista into exile and ruining Michael's plans. Fredo, fearing Michael, runs off; Roth escapes to Miami. Meanwhile, Pentangeli, believing Michael had ordered a hit on him, prepares to testify against him in the Senate's investigation of organized crime. However, Michael has Pentangeli's brother Vincenzo brought from Sicily. Just prior to the hearing, Vincenzo and Frank exchange glances. Understanding the threat, Pentangeli recants his earlier sworn statements, throwing the hearings into chaos and effectively destroying the government's case against Michael. Fredo confesses to Michael that Roth's right-hand man, Johnny Ola, had promised to reward him for information about Michael. Fredo also reveals that he resented being "passed over" to head the family in favor of Michael, and that he withheld key information about the Senate investigation. Michael disowns Fredo, and tells his capo Al Neri that nothing is to happen to his brother while their mother is alive — the implication being Neri has been given a contract to assassinate Fredo after their mother's death. Meanwhile, Kay decides to leave Michael and take their children with her, believing Michael will always live in a world of crime and violence. Michael asks her to reconsider, but Kay reveals she aborted their unborn son because she refused to bring another child into the Corleones' crime world. Enraged, Michael strikes Kay and banishes her, preventing her from seeing their children. Following their mother's death, and at sister Connie's behest, Michael seemingly forgives Fredo, but it is actually a ploy to draw Fredo in closer in order to have him killed. Soon after, Neri murders Fredo on Michael's orders. At the same time, Michael sends Hagen to persuade Pentangeli to commit suicide to spare his family, and has caporegime Rocco Lampone kill a heavily guarded Roth at Idlewild Airport upon his return to the U.S. The film ends as Michael recalls a surprise birthday party for his father on December 7, 1941. In a flashback scene, Michael informs the family that he has dropped out of college to enlist in the Marines. Only Fredo supports Michael's decision. When Vito arrives off-screen, everyone goes to greet him except Michael, who sits alone. The film closes with Michael sitting alone in the Corleones' Lake Tahoe compound. The Godfather Part III is set in 1979 and 1980. Michael has moved back to New York and taken great strides to remove the family from crime. He turns over his New York criminal interests to longtime enforcer Joey Zasa. Ridden with guilt over his ruthless rise to power, he uses his wealth in an attempt to rehabilitate his reputation through numerous philanthropic acts, administered by a foundation named after his father. A decade earlier, he gave custody of his two children to Kay, who has since remarried. He sells his gambling interests to the other Mafia families and reorganizes his vast business holdings as the "Corleone Group". The Holy See has named him a Commander of the Order of Saint Sebastian for his charitable works. At the ceremony, Michael and Kay have an uneasy reunion after nine years. Kay supports their son Anthony's decision to reject the "family business" and become an opera singer, and tells Michael that both she and Anthony know the truth about Fredo's death. Michael had initially wanted Anthony to finish law school, but consents to Anthony going his own way. Michael's new connection to the Church provides an opportunity to take over the large property company, Immobiliare. He is already its largest shareholder, and offers to buy the Vatican's 25 percent share, which will give him controlling interest. He also takes in Sonny's illegitimate son Vincent Mancini, a soldier in Zasa's crew, as his protegé. Michael recognizes that Vincent has inherited Sonny's fiery temper and fears Vincent will suffer his father's fate. Michael also disapproves of the romance developing between him and Michael's daughter, Mary. Michael fears that Vincent's growing involvement in the Mafia will endanger Mary, just as it did Michael's first wife, Apollonia. On the night Michael announces he is dissolving his gambling empire, Zasa wipes out most of The Commission in a helicopter attack in Atlantic City. Michael escapes with help from Vincent and Neri. Michael realizes that his old friend, Don Altobello, is the brains behind the attempt on his life. Traumatized by the attack, Michael suffers a diabetic stroke, briefly incapacitating him. (Francis Ford Coppola reveals in his audio commentary that Michael is seen drinking a lot of water in the first two films—subtle hints that he is a diabetic.) While Michael recovers, his sister, Connie, gives Vincent her consent to assassinate Zasa. Michael is enraged upon discovering this, and demands that no similar orders be issued while he is alive. Michael returns to Sicily for Anthony's operatic debut at the Teatro Massimo. Suspecting that Altobello may make another attempt on his life, he has Vincent infiltrate Altobello's regime under the pretense of defecting. Michael and Kay tour Sicily together, during which Michael asks for Kay's forgiveness. Kay admits she will always love him. Meanwhile, the Immobiliare deal has stalled, supposedly because Pope Paul VI must personally approve it. Michael learns that the Immobiliare deal is an elaborate swindle concocted by Immobiliare chairman Licio Lucchesi, who schemed with Vatican Bank head Archbishop Gilday and accountant Frederick Keinszig to embezzle a fortune from the Vatican Bank, using Michael's "investment" to cover their tracks. Hoping to salvage the deal, Michael seeks Don Tommasino's assistance. He directs Michael to Cardinal Lamberto (the future Pope John Paul I). With Lamberto's prodding, Michael makes his first confession in 30 years, tearfully breaking down as he admits to ordering Fredo's murder. Lamberto tells Michael he deserves to suffer for his terrible sins, but that there is hope for redemption. John Paul I dies soon after being elected pope, poisoned by Gilday. Michael learns that Altobello (in league with the conspirators) has hired an assassin named Mosca to kill him. Mosca murders Tommasino, and Michael vows before his old friend's casket to sin no more. Vincent reports that Lucchesi, working with Altobello, is behind the assassination attempts on Michael. Weary of the bloody, lonely life of a Don, Michael retires, making Vincent his successor, but not before giving him permission to retaliate. In return, Vincent agrees to end his romance with Mary. That night, Michael, reconciled with Kay and Anthony, watches his son's performance in the opera Cavalleria Rusticana. Meanwhile, Vincent orchestrates the murders of Lucchesi, Gilday and Keinszig, and Connie murders Altobello with a poisoned cannoli. After the performance, Mosca shoots Michael, and the bullet passes through his body and hits Mary, killing her. Her death breaks Michael's spirit, and he screams in agony over her body. He returns to Bagheria, Sicily, where he dies in 1997, alone in the courtyard where he married Apollonia. Michael is a secondary character in Puzo's novel The Sicilian, which takes place during his first exile in Sicily. He learns from Clemenza about the legendary exploits of the novel's main character, Salvatore Guiliano (In the novel, the spelling of Salvatore Giuliano's name was intentionally changed by Puzo to "Guiliano". ), and is eager to meet him, but Giuliano is murdered before the meeting can take place. Michael appears in Mark Winegardner's sequel novels The Godfather Returns and The Godfather's Revenge. In Godfather Returns, set roughly during the time of Godfather Part II, Michael battles with a new rival, Nick Geraci, while attempting to legitimize the family. In The Godfather's Revenge, set a few years after the second film, he moves to protect his criminal empire against Geraci and the machinations of a powerful political dynasty, while dealing with his guilt over having Fredo murdered. In the latter novel, he has a relationship with actress Marguerite "Rita" Duvall in the early 1960s, but he ends it upon realizing that he is still in love with Kay. ^ "Capt. Michael Corleone, USMC". bamfstyle.com. BAMF Style. September 2, 2015. Archived from the original on February 10, 2019. Retrieved 10 April 2019. ^ Leong, Anthony (2002). "The Godfather Movie Review". Mediacircus.net. Retrieved April 19, 2013. ^ Coppola, Francis Ford (Director), Puzo, Mario (screenwriter) (March 29, 1971). The Godfather, early script (Motion picture). United States: Internet Movie Script Database. ^ a b Coppola, Francis Ford (Director) (2005). The Godfather Part III DVD commentary (DVD). Los Angeles, California: Paramount Studios. ^ Winegardner, Mark (2005). The Godfather Returns: The Saga of the Family Corleone. New York City: Ballantine Books. ISBN 978-0345478986. ^ Winegardner, Mark (2006). The Godfather's Revenge. New York City: Ballantine Books. ISBN 978-0399153846. Puzo, Mario (1969). The Godfather. New York City: G. P. Putnam's Sons. ISBN 978-0451205766. Coccimiglio, Carmela (2006). "I'm with You Now. 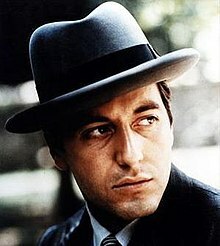 I'm with You...": Michael Corleone as Gangster Figure in Mario Puzo's and Francis Ford Coppola's The Godfather Texts. Ontario, Canada: Lakehead University. ISBN 978-0-494-31189-9. Messenger, Chris (1 February 2012). The Godfather and American Culture: How the Corleones Became "Our Gang". Albany, New York: SUNY Press. p. 31. ISBN 978-0-7914-8870-6. Coppola, Francis Ford (2004). Francis Ford Coppola: Interviews. Jackson, Mississippi: University Press of Mississippi. p. 27. ISBN 978-1-57806-666-7. Bondanella, Peter E. (2004). Hollywood Italians: Dagos, Palookas, Romeos, Wise Guys, and Sopranos. London, England: A&C Black. p. 244. ISBN 978-0-8264-1544-8. Tamburri, Anthony Julian; Giordano, Paolo; Gardaphe, Fred L. (2000). From the Margin: Writings in Italian Americana. West Lafeyette, Indiana: Purdue University Press. p. 406. ISBN 978-1-55753-152-0.